I'm sure I'm going to cop a lot of flak over this choice for my most overrated film of 2014 because “Boyhood” is universally loved by everyone, and I mean everyone. It is so hard to find a negative word written about this film anywhere, but I stand by my decision here. Surely no film deserves the unanimous praise that “Boyhood” is receiving, no matter how good it is. Therefore I believe that the film must be overrated. The thing is though, “Boyhood” is also a film I very much enjoyed myself with it only just not making the cut of my top twenty this year (spoilers! ), however I do not believe it is perfect. The fact of the matter is because this film is a once-in-a-lifetime kind-of deal, I think everyone is enamoured by how brave it was to commit to such a project and for it to actually come to fruition that they are willing to look past the film's flaws. 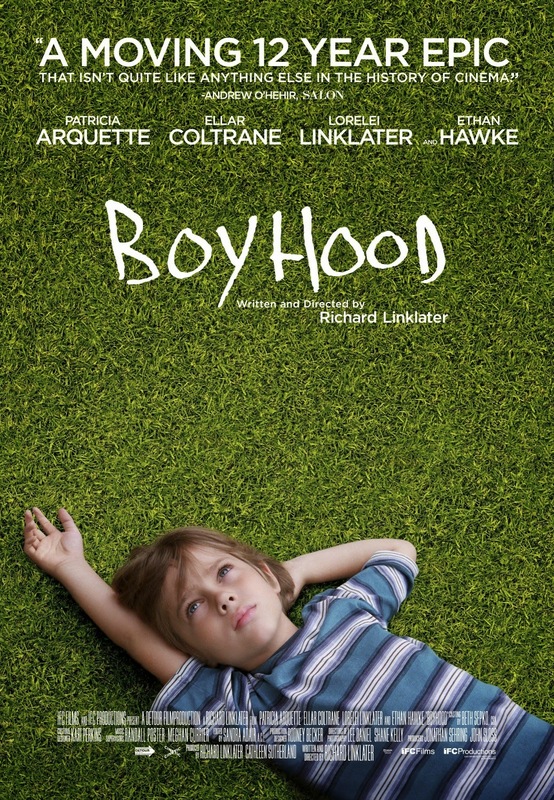 Make no mistake about it, “Boyhood” is a special film that I doubt will ever be repeated. Richard Linklater's decision to shoot the film over a twelve year period, so the actors grew up with the characters they are playing on screen, is as ballsy as it gets because there is just so many ways that this thing could have failed. I bow my head to him for having the guts to do this, but at the end of the day, “Boyhood” is a coming of age tale, the likes we have seen many times before, and frankly it covers no new ground on the subject. Instead it falls into cliché a number of times throughout the film, and is very episodic in nature which I guess was bound to happen when covering such a long period of time. I have also read a lot of praise for the performance by Ellar Coltrane which I only think is half right. In the early scenes in the film, when Mason is just a boy, Coltrane is brilliant. He comes across as so natural and real, but the longer the film goes along and as Mason enters his teenage years, Coltrane's performance is less impressive, at times he even looks unsure at what he is doing. It is like when he was a kid, he was able to just be in the moment and didn't care that he was in a movie, while in the later scenes he was aware of everything going on around him and thus was much more self conscious in his portrayal of Mason. On the positive side though, I thought Lorelei Linklater who plays Samantha (Mason's sister) was great throughout, and the two actors who played their parents, Patricia Arquette and Ethan Hawke, were both outstanding; truly stellar work from this pair. I must admit that there is something cool about watching the actors and characters age in front of your eyes; it is always interesting seeing what they are going to look like (and its also as interesting seeing just how little adults age over the course of twelve years), and there are a number of scenes in this film that are beautifully realised and are so honest, but at the same time there are those that are just as clunky particularly in the latter scenes. Again, let me state that I really like “Boyhood” (its a four star film for me) and I look forward to adding it to my blu-ray collection in the future, but it is not the perfect film that everyone is claiming it to be, which therefore by definition makes it overrated. (Please don't hate me! ).